This time-release formula packs a powerful punch of vitamin B12 and folic acid. These elements are beneficial to women wishing to conceive or are in the first three months of pregnancy. 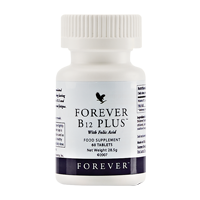 B12 is also essential to vegetarian or vegan diets as it's normally obtained from animal sources. Keep out of reach of young children. Store tightly closed in a cool, dry place. Do not use if seal is broken or missing. Food supplements should not be used as a substitute for a varied and balanced diet and a healthy lifestyle. If you are taking any medications or under medical supervision, please consult a doctor or healthcare professional before use. Do not exceed the recommended daily dose.